Surgical excision of involved tissue, with microscopic identification of parasite. Frequently calcified cysts present on x-ray or computed tomography (CT) scans. Positive serology indicating previous exposure to T solium. Fine-needle aspiration of cysts (characteristic cytomorphology). Cysticercosis is caused by invasion of tissue by the larval forms of T solium, which have been referred to as Cysticercus cellulosea, although the name is not taxonomically correct and introduces confusion. Within a host infected by the adult T solium, eggs or proglottids are passed in the stool. Once eggs or proglottids are ingested by either pigs (intermediate hosts) or humans (definitive and intermediate hosts), eggs hatch in the gastric juice, allowing the cysticercus to migrate from the intestine to disseminated sites, via efferent mesenteric venules. Autoinfection may also occur in humans, wherein eggs produced by the adult intestinal worm hatch and invade the intestinal epithelium. 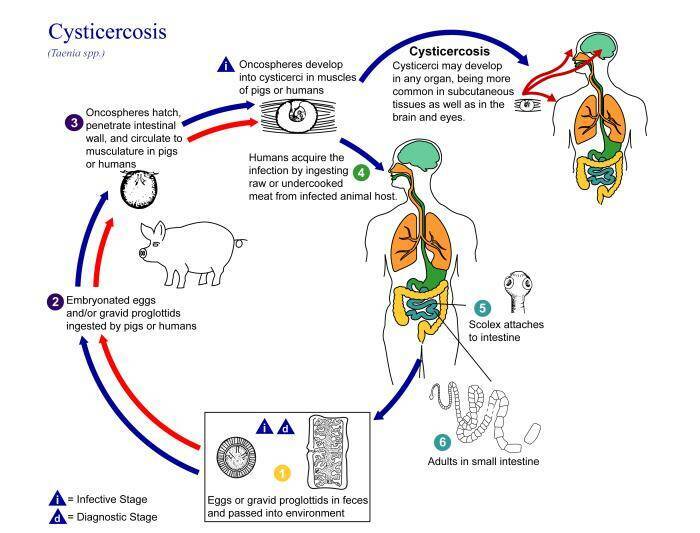 The symptoms associated with cysticercosis relate to the organ that is invaded by cysticerci and to the inflammatory reaction that occurs in response to the larva. Within the brain, cysticercosis may cause arachnoiditis or chronic meningitis, with associated headache, vertigo, vomiting, and cranial neuropathies. Alternate presentations include obstructive hydrocephalus with ataxia and dementia, intracranial vasculitis with focal neurologic signs and neuropsychiatric changes, or mass effect with seizures, headache, or focal neurologic deficits. In addition, cord compression with lower limb weakness and loss of bowel and bladder continence may occur. Cysts outside the central nervous system tend to occur within muscle, are most often asymptomatic, and eventually die, calcify, and may be incidentally detected on radiographs. Occasionally, muscle cysts will cause pseudohypertrophy that may be associated with myositis, high fever, and eosinophilia. Cysts may also occur within critical organs (commonly heart and liver) where they present as mass lesions with pain or obstructive symptoms. Patients with cysticercosis may have a mild elevation on leukocyte count, possibly with eosinophilia. In patients with meningitis associated with neurocysticercosis, cerebrospinal fluid examination may show either lymphocytic or eosinophilic pleocytosis, hypoglycorrhachia, and elevated protein. Recently a serologic test for T solium has been developed, but its performance characteristics remain to be validated. False positive results have been associated with infections caused by other cestodes. A negative serologic test does not exclude the diagnosis of cysticercosis. Living cysts associated with cysticercosis are often multiple and have a characteristic appearance on CT scans or magnetic resonance images, both enhancing and nonenhancing unilocular cysts. Patients with extraneurologic cysticercosis may have painless subcutaneous nodules, often on the shins, which are calcified and have a characteristic appearance on plain radiographs. Patients who seek care for symptoms of infection with T solium most commonly do so because of the neurologic symptoms associated with neurocysticercosis. The most common neurologic symptoms are mass effect and seizures (related to intraparenchymal lesions), hydrocephalus (related to intraventricular cysts), chronic meningitis (related to subarachnoid cysts), and cord compression (owing to spinal cord cysts). The differential diagnosis of each of these symptoms is beyond the scope of this discussion, but malignancy may present in identical ways, and so it must be ruled out. Visceral cysticercosis is also commonly asymptomatic, but may obstruct local structures (eg, biliary obstruction in hepatic cysticercosis). Neurocysticercosis may lead to permanent neurologic impairment, coma, or even death. Therapy for cysticercosis includes surgery when feasible and necessary, in combination with praziquantel or albendazole (see Box 2). Therapy of cysticercosis commonly increases the local inflammation, thereby transiently causing a paradoxical worsening of the patient's symptoms. Whether corticosteroids should be used as adjunctive therapy for patients being treated for neurocysticercosis remains in debate. The mortality rate for untreated neurocysticercosis approaches 50%, but treatment decreases this rate to 5-15%. Guidelines for the prevention of cysticercosis are the same as for the prevention of T solium infection (Box 3).